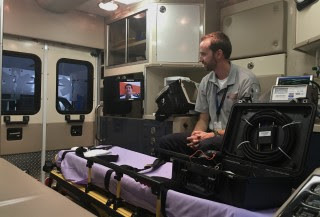 Paramedic Brett Schneider uses iTREAT to consult with Andrew Southerland, MD, a stroke expert at the University of Virginia Health System. Newswise, July 1, 2016— A research advance from the Sanford Burnham Prebys Medical Discovery Institute (SBP) and Stanford University could lead to new drugs that minimize the damage caused by heart attacks. The discovery, published today in Nature Communications, reveals a key control point in the formation of new blood vessels in the heart, and offers a novel approach to treat heart disease patients. “We found that a protein called RBPJ serves as the master controller of genes that regulate blood vessel growth in the adult heart,” said Mark Mercola, Ph.D., professor in SBP’s Development, Aging, and Regeneration Program and jointly appointed as professor of medicine at Stanford University, senior author of the study. In the US, someone has a heart attack every 34 seconds. The ensuing loss of heart muscle, if it affects a large enough area, can severely reduce the heart’s pumping capacity, which causes labored breathing and makes day-to-day tasks difficult. This condition, called heart failure, arises within five years in at least one in four heart attack patients. The reason heart muscle dies in a heart attack is that it becomes starved of oxygen—a heart attack is caused by blockage of an artery supplying the heart. If heart muscle had an alternative blood supply, more muscle would remain intact, and heart function would be preserved. Many researchers have therefore been searching for ways to promote the formation of additional blood vessels in the heart. “Studies in animals have shown that having more blood vessels in the heart reduces the damage caused by ischemic injuries, but clinical trials of previous therapies haven’t succeeded,” said Ramon Díaz-Trelles, Ph.D., staff scientist at SBP and lead author of the study. “The likely reason they have failed is that these studies have evaluated single growth factors, but in fact building blood vessels requires the coordinated activity of numerous factors. Our data show that RBPJ controls the production of these factors in response to the demand for oxygen. “We used mice that lack RBPJ to show that it plays a novel role in myocardial blood vessel formation (angiogenesis)—it acts as a master controller, repressing the genes needed to create new vessels,” added Diaz-Trelles. “RBPJ is a promising therapeutic target. It’s druggable, and our findings suggest that blocking it could benefit patients with cardiovascular disease at risk of a heart attack. It may also be relevant to other diseases,” commented Pilar Ruiz-Lozano, Ph.D., associate professor of pediatrics at Stanford and adjunct professor at SBP, co-senior author. This research was performed in collaboration with scientists at Stanford University, Washington University in St. Louis, and the University of California, San Diego. Funding was provided by the National Institutes of Health, the Sanford Children’s Health Center, the American Heart Association, the Burroughs Wellcome Fund, the California Institute for Regenerative Medicine, the Italian Ministry of Research and Education, and the Italian Society of Cardiology. The Stanford University School of Medicine consistently ranks among the nation’s top medical schools, integrating research, medical education, patient care and community service. For more news about the school, please visithttp://www.med.stanford.edu/school.html. The medical school is part of Stanford Medicine, which includes Stanford Health Care and Lucile Packard Children’s Hospital Stanford. For information about all three, please visithttp://www.med.stanford.edu.